Legacy presented the Charles Sumner School Museum and Archives. 1201 17th St. NW DC. 10a-3p. Free! 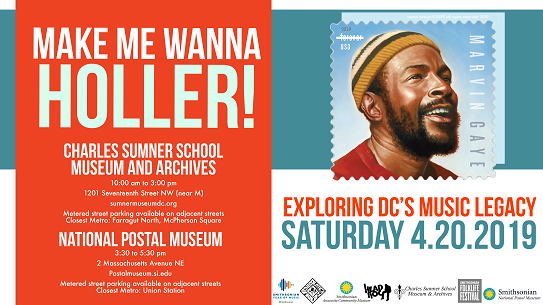 This event is produced in conjunction with the Charles Sumner Museum and Archives’ National Poetry Month Open House, Chocolate City Rocks, the Anacostia Community Museum’s Right to the City exhibition, the National Postal Museum’s celebration of the US Postal Service’s new Marvin Gaye stamp, and DC: The Social Power of Music presented by the Smithsonian Folklife Festival. This free, fun event, presented at two historic DC buildings, features the social power of local music and poetry. On April 2, 2019, the US Postal Service released its new stamp honoring Marvin Gaye, DC native son and international music legend. In celebration, join us for a day of activities, discussion, and performances that explore DC’s rich music history—its legacies and contemporary resonances. CHOCOLATE CITY ROCKs produced Panel Discussion is from 12:30p - 2p. Panel includes: Ras Lidj (Go-Go), Dimensions (The Package/A.R.K./Infinite Loop), Elise Bryant (DC Labor Heritage Foundation), and Katy Otto (DC Punk/Trophy Wife). Visit the FB Event Page for more information and day programming schedule. 05.19.19 Washington, DC: Chocolate City Rocks presents: The R.Y.E. Bred Project Listening Party. Chicken + Whiskey. 1738 14th St NW. 2p-4p. More Details TBA. "Chocolate City Rocks" is a DC based grassroots programming initiative started in 2010 by Vance “Head-Roc” Levy, to promote a greater public awareness and patronage of Washington DC area conscious and cultural artists. "Chocolate City Rocks August 23, 2014." "Chocolate City Rocks September 13, 2014." "Chocolate City Rocks September 14, 2014." "Chocolate City Rocks October 25, 2014." "Chocolate City Rocks December 13, 2014."